Well, I dont know what feeling should accompany this. Last week, I completed 2 years of cubicle life. Dont know whether to be happy or sad about that.. It has been a roller coaster ride. That last two years were definitely not the best, but at the same time not the worst.. Can't call it mediocre too. At times I feel I'm not made for this cyber life, but then, I havent found another avenue for myself. I hate to chase cash..but in the end, i may endup doing that. Life is twisting and turning from one phase to another. Even though I havent saved a huge amount or anything like that,I'm at a much better position financially than I was when I left NITC. Thats one aspect upon which I should thank Oracle.Honestly, I feel the salary to effort ratio is pretty high here. About Hyd -- a great city.. U have something here for all kinds of people. From great historical museums and forts to the marvellous hitec city and Imax , the list is very long. I'll put up a detailed post about Hyd sometime..Only minus point that i see is the distance to Kerala. World cup...Nothing encompasses its spirit. It breaks all barriers of human civilization. Where else could you see Iran playing against United States ? Where else you see legions of fans wearing different colours cheer their favourites ? What else unites people across obscure nations in Africa to the hitec world of Japan ... The spirit of this festival is simply indomitable. 1990 -- Saw my first worldcup as a kid..I didnt know the true significance or the size of this . But that spirit was unique. The still lasting memories of this worldcup include Cameroon's play, Walter Zenga diving in vain to save Maradona's penalty, and finally Germany winning the coveted trophy. 1994 -- By this time, I had begun to read a lot on sports..And saw this worldcup acknowledging the true spirit . The memories include Andres Escobar's self goal and his subsequent murder, Diego playing magnificently against Nigeria and failing the drug test after that, Branco's free kick which helped Brazil to sail over the Netherlands in the quarterfinal, Baggio's heroics..and his subsequent missed penalty in the final..
1998 -- My quizzing career till plus two had really enriched my knowledge on soccer. 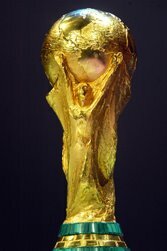 This was another magnificent cup..The Paraguayans holding down France till minutes of extratime,Argentina - England second round match with the theatrics of Simeone, Davor Suker taking the golden boot, Bergkamp's magnificent goal against Argentines in the quarter final, Dutch losing out on penalties against Brazil, and finally, France getting to the podium in front of their home crowd and Didier Deschamps holding the trophy..
2002 -- The best place to see a soccer match if you cannot go the stadium , is a hostel common room. Whoah..I still relish those memories in NITC hostel..The best being Ronaldinho's lob from the halfway mark to fool David Seaman. But, somehow I felt , this Worldcup lacked good contests except very few..Most of the good teams where knocked out initially itself.Anyway, the spirit of football ruled..and Brazil won..
2006 -- I like cheering underdogs, and true to that my teams are Netherlands and Czech Republic this time..Though both of them doesn't look a cup winner material,I wish they reach atleast Semifinals. Whatever, its the victory for the ultimate human spirit..
Worldcup is an event which taught me one good lesson in life..No matter how good you are,sometimes things doesnt come to you. Truth and justice are two different things..You must not argue for justice unnescessarily to anyone.If justice to talent was to happen in the soccer field, Hungary under Puskas would not have lost the 1954 final, Holland under the magnificent Cruyff would have won the 1974 cup ..like that so many examples...Its not the so called 'fate',in which I dont believe. It is because that nobody would get all the things in life that he wants, everyone loses some..and sometimes those loses are more visible. -- I wish on one day I could go and see a world cup match live..That would be simply superb.